Titled "The Royal Gadget Pack"
I am a fan of the puzzle/platformer Chariot. The wife and I put in a good chunk of time playing through the game on our PS4; working together to not only get every collectible we could but in some cases to just make it through a level. So I'm glad to hear that it will be getting some DLC love, even if it is for the Xbox One version only. "The Royal Gadget" pack will arrive sometime this month, no date or price has been set, and will allow players to play as the Shopkeeper (he's the skeleton dude with the jaunty hat) as well as have access to all new gadgets. 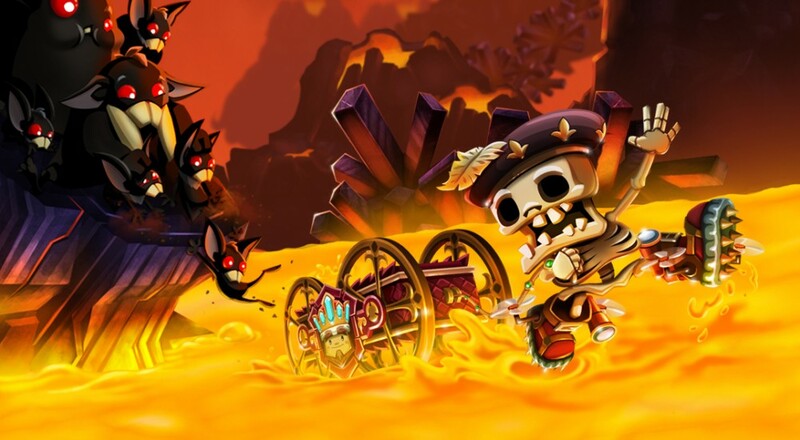 The tools/gadgets, like being able to put a spike in the ground/wall/ceiling and attach the titular chariot to it, in this game make a real difference when solving many of the game's puzzles. I suspect that some of the new gadgets may not only break some of the earliest conundrums, but will also make some later levels a little more manageable. It'll be interesting, too, to see what new ways speedrunners clear some of the stages by utilizing these new tools.